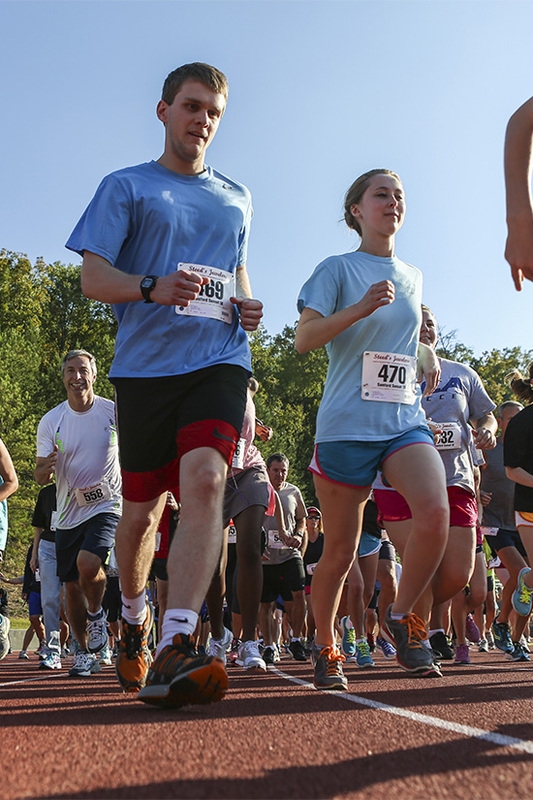 Almost 200 participants ran or walked to support scholarships for Samford University students in the Legacy League’s third annual Sunset 5K on Saturday, Oct. 25. After expenses, proceeds totaled more than $5,500, Legacy League leaders reported. These proceeds will help endow the group’s 24th named scholarship, said Legacy League president Karen Bergquist. “In honor of Orlean Bullard Beeson School of Education’s centennial anniversary, this scholarship will be awarded to Samford students with significant financial need who are pursuing a career in education,” Bergquist said. The 5K attracted men, women and children in age brackets from 14 and under to 70-plus. The event, held on a scenic trail near the Samford campus, concluded with a 1-mile Fun Run, awards ceremony and barbecue meal. More than 40 volunteers assisted to make the event possible. The Sunset 5K is one of four annual fund-raising events sponsored by the Legacy League. Upcoming events include the Christmas Home Tour on Dec. 11, a presentation by Christian comedian, musician and “Momisms” creator Anita Renfroe on Feb. 19 and the scholarship gala on May 7. During 2013-14, the Legacy League raised more than $80,000 to endow a new scholarship. Sunset 5K sponsors were Brannon Honda, ARC Realty, Event Rentals Unlimited, Full Moon BAR-B-QUE, Trak Shak, Brookwood Endodontics, Caldwell Mill Animal Clinic, Champion Cleaners, Pure Barre, Reeves Cosmetic Dentistry, State Farm agent Michael O’Neal, State Traditions, Steed’s Jewelers, Taco Casa and Witt Chiropractic. Contributing sponsors were Yogurt Mountain, Chick-fil-A, Dawson Family of Faith, Medco Sports Medicine, Samford Athletics and Taziki’s.